SoPo Cottage: Late Breaking Decision Time - Should we Add a Mudroom?? Late Breaking Decision Time - Should we Add a Mudroom?? Since this house has a basement level garage, we assume that will be the entrance the new owners will use the most. It's pretty easy to just drive into the garage and enter through the basement door - right in the house! But, it's a pretty ugly entrance - bare concrete walls and an overwhelming amount of drab gray. 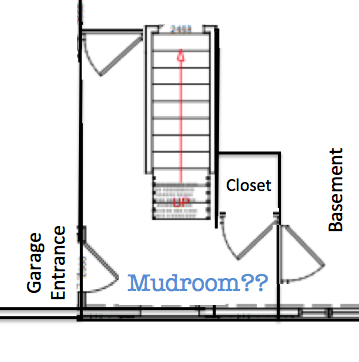 So instead of leaving that space as an unfinished basement, we're trying to decide if we should create a mudroom entrance. The Basement…..not a thing of beauty! Now that the basement has been waterproofed, it's not a terribly difficult job. Before drywalling, we could add foam board insulation and strapping to the walls. Of course we'd have to have our electricians come back out to wire it up. And the trickiest part would be moving some of the heat pipes that criss cross over the ceiling. Oh, and then we'd need to add a heating unit to keep it toasty warm. And do built-ins to hide the water meter. And we'd probably want a built-in bench to pull boots on and off. And a set of hooks for coats. And maybe a big closet….. But seriously, do you think that would be a good selling feature? Is that something you would want in your new house? I'd love your input! Want to see more updates? Like us on Facebook - just click here! I thoroughly enjoy following your progress on the homes you renovate. It's nice to see someone who doesn't just go in and do a "Home Depot Special" on them, but respects the integrity of the house. And, yes, absolutely a mudroom would be a good selling feature. I would definitely want one in a new house. There's nothing worse than wet coats and boots piled up in the living areas. Yes, definitely add a mudroom. In the northeast I think a mudroom is a great feature and if you think this will be the primary entrance I was think it would be a good investment. I would be warily of investing too much into this project as it may be something they don't even think about (the logistics of actually using that door) and you might find that they miss the added benefits and in turn additional cost. that's a great feature to have in that area, I say go for it! Absolutely! Who wouldn't want a mudroom and additional storage? You could even incorporate a bit of the industrial look so popular now. I think it would definitely be a bonus, but I don't think it's a deal breaker by any means if it isn't there. Oh yes... speaking from someone in the NE without one, what I wouldn't give to have one. Ha ha….my thoughts exactly! We don't have a garage or a mudroom!! 100% yes! One of the reasons we are leaving a house we only have lived in for 18 months and building a custom home is because we don't have a mud room (well that and a back yard!) but it's a huge deal for me not having one. Right now you walk from the garage directly smack into the middle of the kitchen with the closet around the corner and down the hall. No one but me ever takes off their shoes before tracking down the hall to hang up coats. It drives me crazy. The extra hassle and money for you would really be worth it in the end to add a mud room. Living in seattle I can attest to how much you need a place to take off wet shoes and coats! There is a small closet as you come in the front door of this house, but I can't imagine many kids (or husbands) being good about carrying all their stuff upstairs after they come in through the basement garage entrance!! Thanks for the advice! It's a huge selling point in New England. I went house-hunting with my sister over the weekend. Her family is moving out of the city and into the Boston suburbs. We viewed several beautiful homes... A well-designed and organized mud room is a huge point of consideration for her. The two homes that made it to the top of her list each had a mud room and she raved about them more than the marble bathrooms or granite kitchens. Wow Maureen, that's great input! Not sure I can skimp on marble or granite in our plan, but a place to keep all your STUFF is important! One of the reasons we bought this house when I was pregnant with our twins is that there is a great mudroom! It's not only great for winter and dealing with snow, but perfect after summer times out to the water or making mud pies. Absolutely do it! It's a must! Don't skimp! Build it like it was supposed to be there all along! I think it's always one of those spaces in a home that can always be bigger. Personally, I don't see a huge need to heat a mudroom. People won't be lingering there and most of the heat will woosh out into the garage or basement when the door is opened. Perhaps just enough to keep it from being totally frigid, but no more. But adding a mudroom in general is a great idea.